Some days we get to go out and splurge on decadent dinners, but most days we’re just a couple of recent college grads who want to sit down to some homemade comfort food after a long day at work. For us, fried rice is one of these comfort dishes that always comes through for us with a satisfying meal when we’re pressed for time. 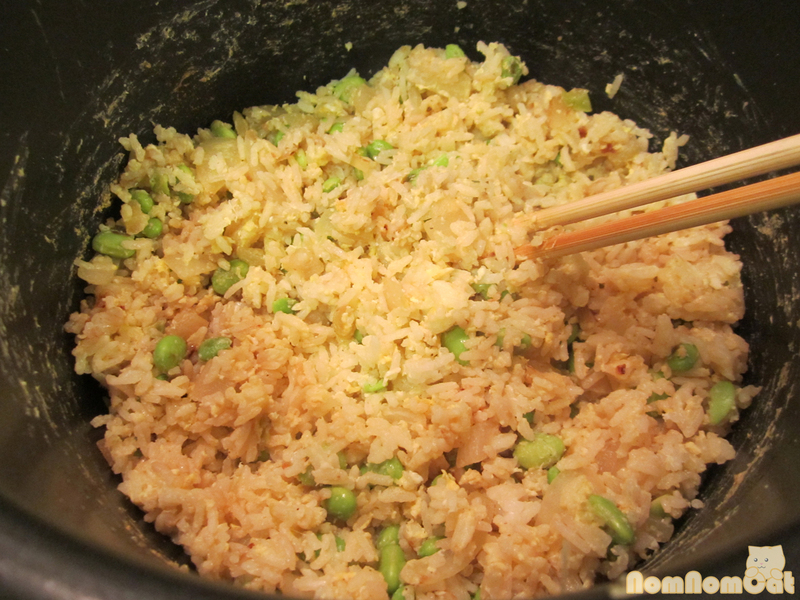 Recently, I started added edamame to my fried rice. It was a weird change since, as a child, I didn’t even like peas in my fried rice and I would spend the first five minutes in front of my bowl carefully extracting each pea one by one with my chopsticks. But for whatever reason, I love adding edamame to my fried rice, and Trader Joe’s sells them already shelled and frozen, making life that much easier. 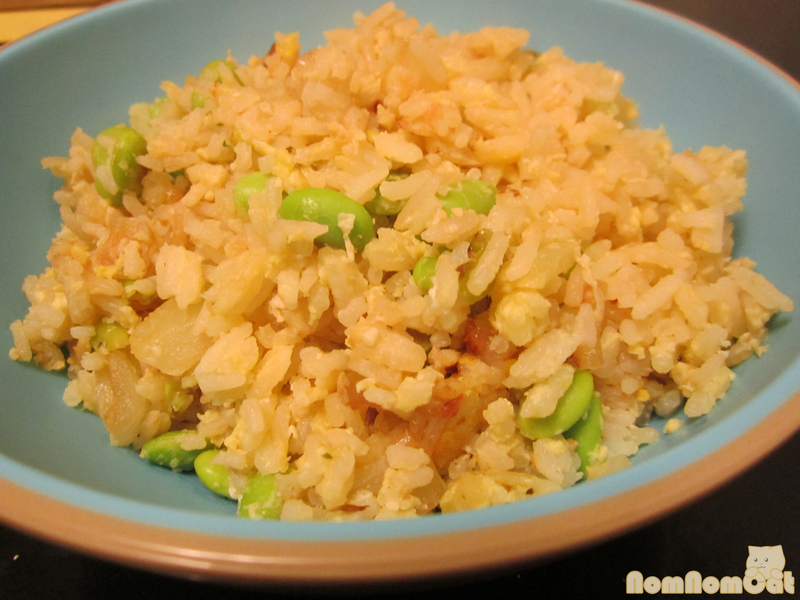 Edamame, or green immature soybeans, are a great way of kicking up a plain ol’ fried rice with some beautiful bright green color and a nice crunchy texture, not to mention the high protein and fiber content! Martin doesn’t like the change in texture, so sometimes I just add some to my portion, or if I have leftovers, I’ll toss in a handful of edamame straight out of the freezer and heat them up together in the microwave. Without further ado, here is the recipe for making this ovo-vegetarian (that is, vegetarian + eggs) dish that you could serve as a side dish or eat on its own as a hearty, well-balanced entree. Heat the olive oil in a large pot or wok (you’ll want lots of room to mix and toss the rice around) on medium-high heat. Saute the garlic and onions until softened and almost translucent. 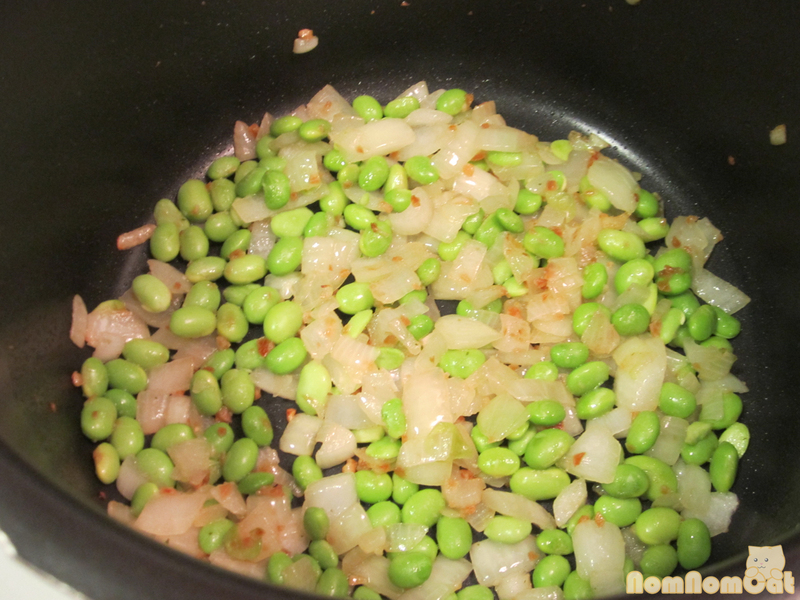 Add the edamame. You’re mostly looking to “defrost” them if using frozen, but I ended up browning mine a bit and it tasted pretty good with a nice nutty flavor. Pile on the rice and crack the eggs on top. Stir vigorously to coat so that everything is a nice golden color. Season to taste with some garlic salt, black pepper, and soy sauce of choice. If you like your rice a bit crispy, crank the heat up to high and let the rice sit for a few minutes, stirring occasionally just enough to prevent burning but not too frequently so it will have a chance to brown. Serves 4. Let us know how it goes! We hope you’ll add this recipe to your weeknight dinner rotation. After hearing some feedback on our previous posts, I realized I have taken for granted having grown up in the very large Vietnamese enclave in Garden Grove and Westminster of Orange County, so I thought I’d write a short post with some info and fun facts about the magical (maggi-cal!) 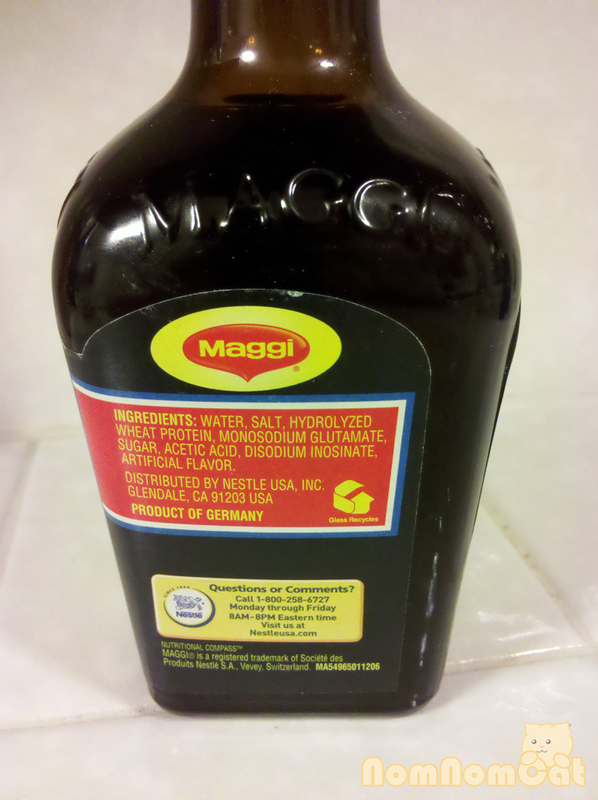 Maggi Seasoning Sauce as a follow-up to our previous post regarding com do. All varieties of Maggi (even the tiny and large sizes) have the same shaped bottle. 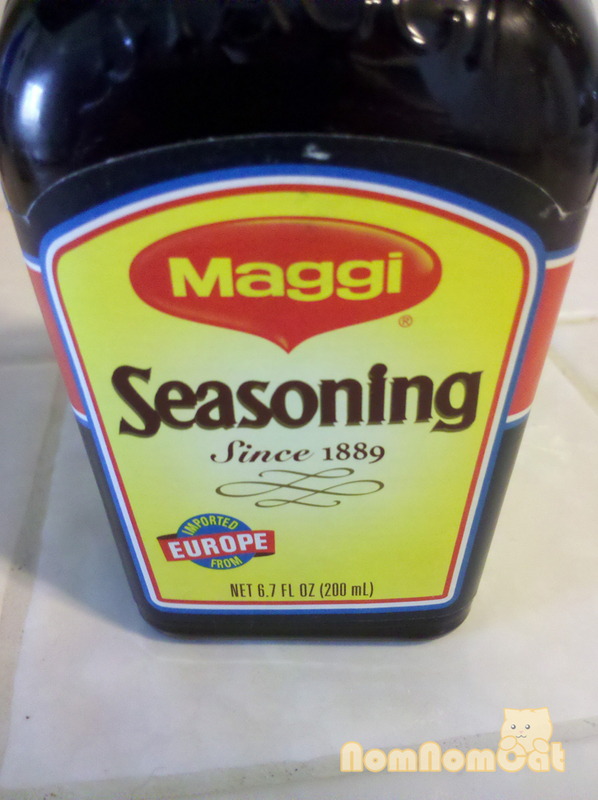 Maggi Seasoning Sauce is a product from Europe, one of many Nestle products ubiquitous the world over. I (and many Maggi-users I know) pronounce it with a zh sound (mah-zhee), probably stemming from the French j sound (zh is the best I could think of to transliterate the sound, but think of the j in bonjour and that’s what I’m trying to capture). However, the German pronunciation would yield a more g-like sound; think of the nickname for the girl’s name Margaret. Whichever way you choose to pronounce it, it’s a delicious condiment! It resembles soy sauce but with a deeper flavor and less of the saltiness. According to Wiki, it is “a dark, hydrolysed vegetable protein based sauce which is very similar to East Asian soy sauce without actually containing soy.” It is popular in Asian cuisines, particularly Vietnamese as a result of the French colonization period (from which banh mi is another culinary by-product). The flavor is difficult to describe, but there are definitely French-Vietnamese dishes that would not be the same without it. Keep your eyes peeled for this Maggi label! Your best bet would be a Vietnamese or Chinese supermarket. For people in So Cal, you’re set if you live within driving distance of either the San Gabriel Valley or Westminster/Orange County. I believe some Korean and Japanese markets may carry it too, but individual store inventory will vary. If you feel daring, you can even try the “Asian Goods” section of a national chain store (Ralphs, Albertons, etc.). I even found Maggi on Amazon.com but you would definitely be paying a premium if you go that route. I personally prefer the one from Germany. Maggi is produced in many countries worldwide, but there are subtle differences among them when it comes to flavor and quality. For us, buying a 6.75 oz bottle of the German import off the shelf at a grocery store would run us about $4. It also comes in large 120 mL bottles, small 3 oz bottles, and even teeny tiny single serve bottles (I’ll have to track these down and take pictures to post here!). Look for the tiny text that says “Product of Germany”! Definitely drizzled Maggi on that Vietnamese tomato red rice! ** NOTE: Maggi Seasoning Sauce is not particularly healthy. If you’ll note on the photo above of the side label, the ingredients include, among other things, MSG. Please take caution if you are on a restricted or low sodium diet. Everything in moderation (but consult your doctor or dietician if you are unsure). 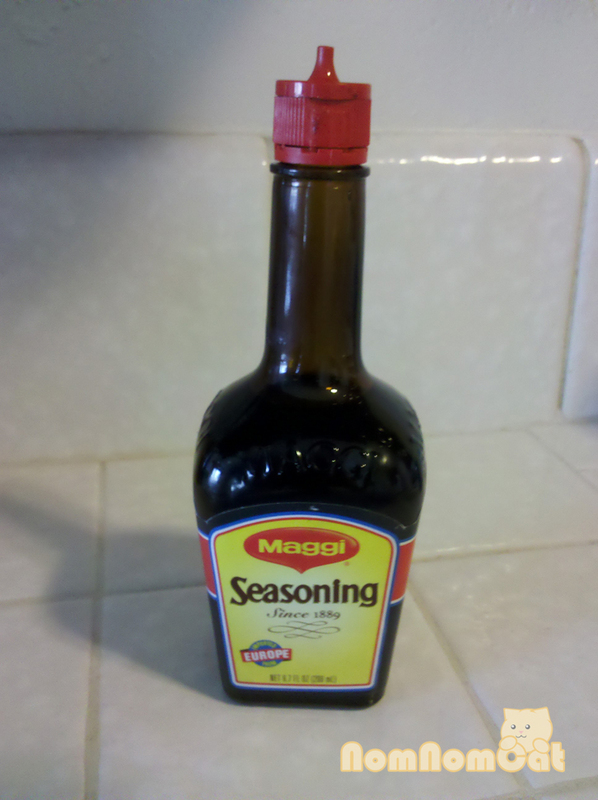 I hope this blog entry helps those of you who are wondering about Maggi Seasoning Sauce. As always, we welcome your feedback and questions and love to hear from you! One of our favorite sides in French-Vietnamese cuisine is com do — a beautifully bright red stir-fried tomato rice often served with rotisserie or roasted meats. 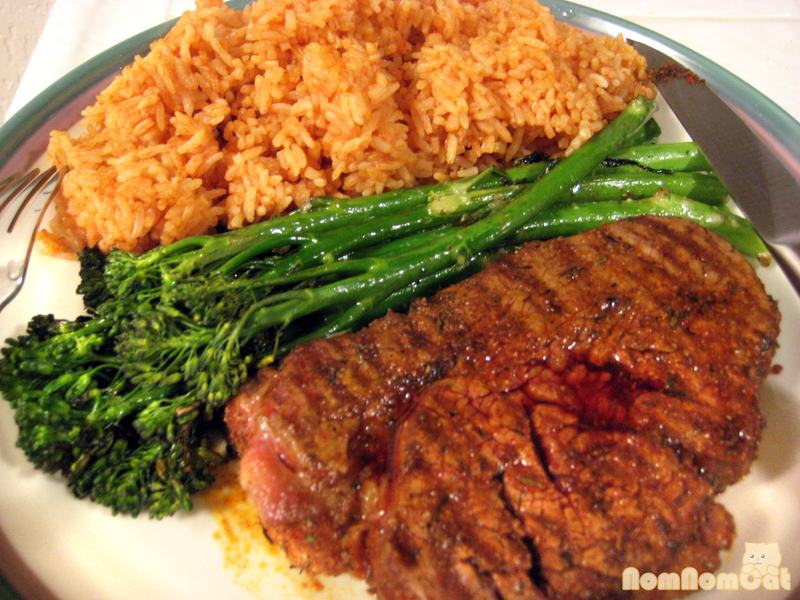 It’s quick and easy to make, and it’s a great way to use up leftover white rice! 1) The Rice: You definitely need the long grain Vietnamese jasmine rice to get the proper texture. The Japanese botan rice (and its equivalents) will be too sticky and sweet. Whichever rice you would use to make fried rice will be perfect. Either cook it in a rice cooker with a bit less water than you would normally use, or use leftover rice from a day or two before so that it will be dry enough to not clump when sitrfrying. 2) The Seasoning: Maggi is maggi-cal! It’s darker in color than soy sauce and has a deeper flavor than just plain saltiness. It’s a critical flavoring agent for making and eating com do. You should be able to find it in any Asian grocery store and even in the “Asian” goods section of chain grocery stores as well. If given the option, spring for the higher priced (and higher quality) variety imported from Germany. It’s worth the extra few dollars. :) For additional info, hop over to our follow-up post! 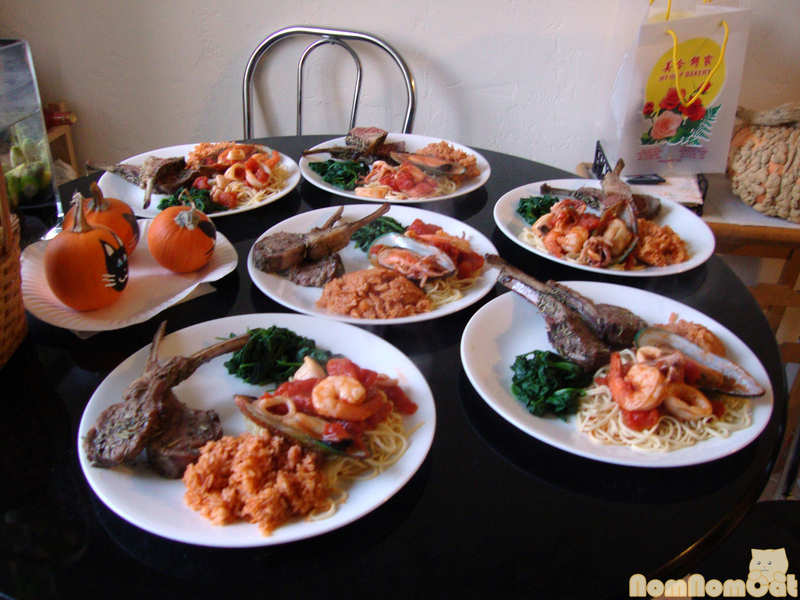 We mentioned com do in our post about herb roasted rack of lamb. Maybe they should rename it to com cam (orange rice). By any name, it’s a delicious side dish! If cooking the rice shortly before making com do, be sure to leave the rice cooker lid open after it “clicks” finished so that the steam will escape and allow the rice to dry out a bit. In a deep pot (you’ll want room to toss the rice without losing any), heat the olive oil and minced garlic over medium-high heat. Just as the garlic is starting to brown, add all of the rice. Toss to evenly distribute the oil-garlic mixture. 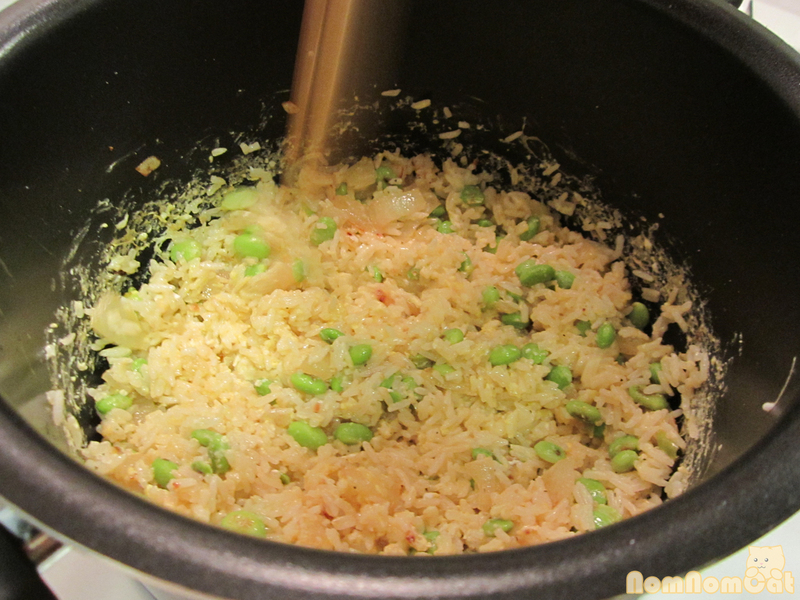 If you are using leftover rice, you will need to increase the time for this stage to allow the rice to warm up. 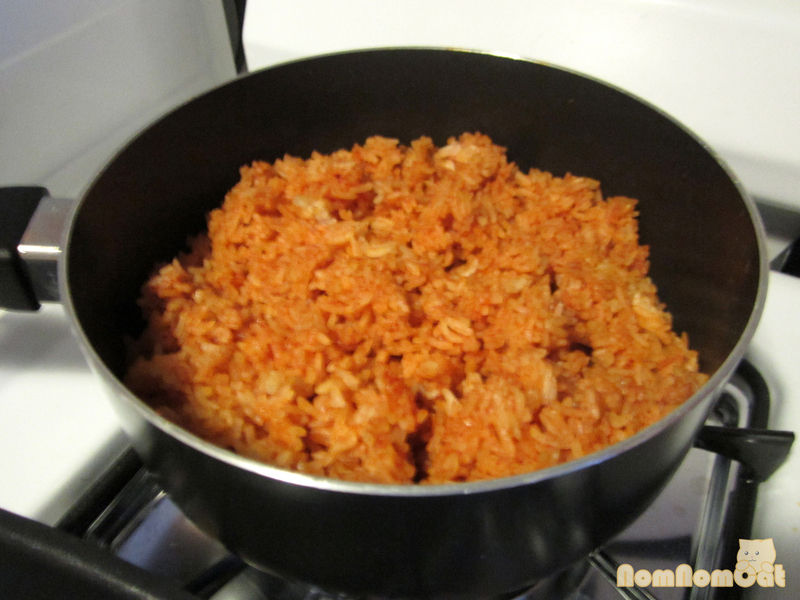 Add the tomato paste and stir vigorously to coat the rice. You should not have any white or dark red splotches; all of the rice should take on an even orange-red color. Season with salt, pepper, and Maggi. Let it sizzle on high heat for a few minutes if you like your com do a little crispy. Enjoy! If you have leftover tomato paste, scrap the contents of the can onto a sheet of plastic wrap. Fold the plastic wrap to create a little bundle. Place in a plastic bag and stick it in the freezer. The next time you need to use it, just break off a piece, wrap up the rest, and put it back in the freezer. This preserves the shelf life of the opened tomato paste much better than leaving it in the can (which can make the tomato turn rancid in just a few days).